It's all about "teamwork" in our class! For our unit of inquiry, we have been studying about how leaders and teams work together to represent their national identity. The students have been doing various activities as teams with leaders to help understand this concept. Our class works together well and have been good examples of what teamwork should be like! Our 43rd National Day Celebration! As we are studying how "humans impact the ocean habitat", we went on a field trip to help reinforce this concept. The students had a lovely day on a boat ride and were able to see all kinds of ways the humans impact the Abu Dhabi ocean habitat. They came up with ways that we can keep it more clean and how to take care of our ocean better. "Humans impact the oceans habitat"
As a part of our unit of inquiry, the students created “ocean dioramas” depicting different ocean scenes. This was a great experience as we are reflecting on how “humans impact the ocean”. Ms. Amy's class in grade 4 have paired up with our class to read. Our new grade 4 reading buddies have been reading to us and with us to help strengthen our reading skills! We had a lovely Healthy eating day in grade 1! Thank you so much for sending in yummy fruit snacks with your child. The students have been enjoying Library time. They are learning to select the correct book and silent read on their own. The students in grade 1 had a Hajj in the ENS gymnasium. This day was enjoyable and full of memories for the class. The students have had a busy and successful first month of school. They had taken their first spelling test using their "quiet walls", practiced spelling and skip counting through stations and activities as shown in the pictures above. Also, the students have been keeping the "healthy eating" rule in school by bringing in fruit to share for their birthdays. Great job grade 1.2! 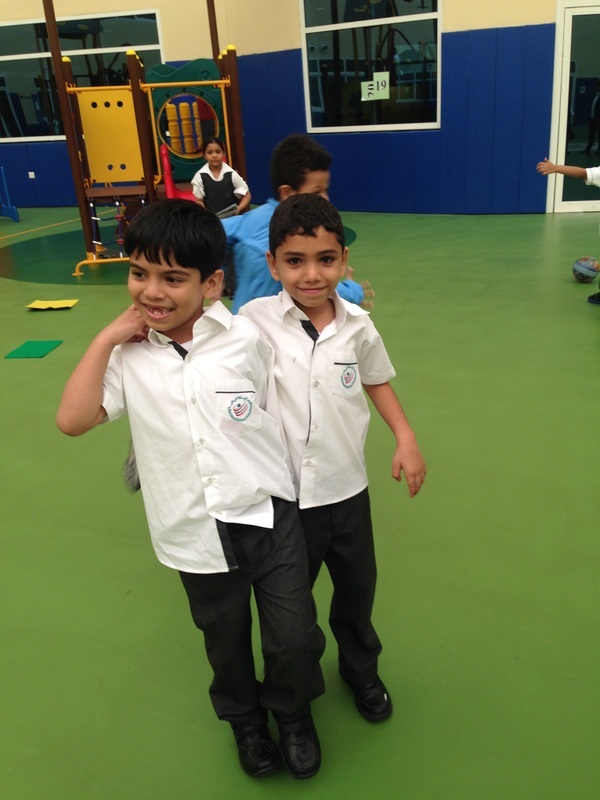 These students were demonstrating "caring" on the playground. Our first week in school was successful! The students were practicing to read in pairs of two as well as by themselves. 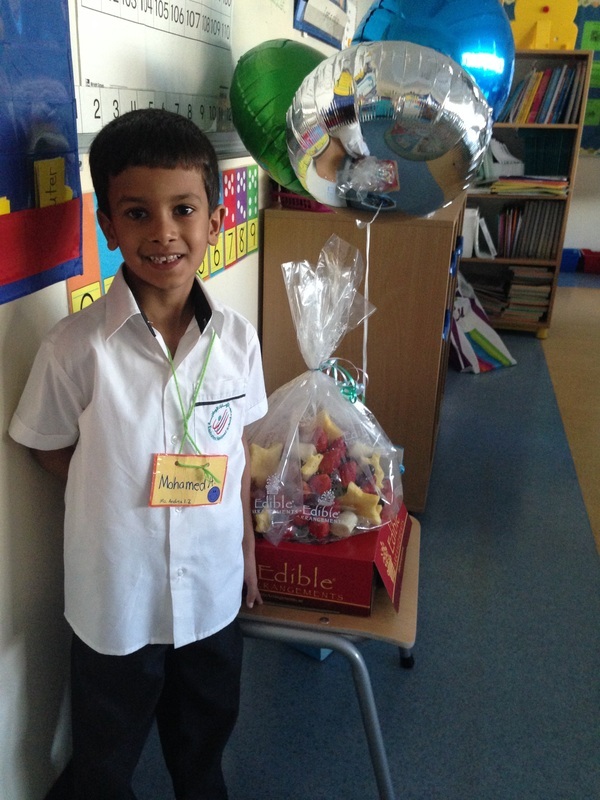 This student followed our school's "healthy eating" rules and brought in yummy fruit to share for his birthday!